BETWEEN the 1960s and 1990s, if there is one thing that is different, it is the level of material consumption of the richer sections of the world. Says Swedish environmentalist Anders Wijkman, "When I used to go to school in the 1950s, I was one of the few kids in my class with a car in the family. But my kids will now find it difficult to find a classmate whose family does not own a car." Alan Durning of the Worldwatch Institute says in his new book How Much is Enough?, "Since its birth in the US, the consumer society has moved far beyond American borders, yet its most visible symbols remain American. The Disneyland near Tokyo attracts almost as many visitors each year as Mecca or the Vatican. Coca-Cola products are distributed in 170 countries. Each day, a new McDonald's restaurant opens somewhere in the world." By the mid-1960s, Western Europe and Japan had become part of the global consumer society. Per capita consumption of heavily packaged and processed frozen foods doubled in Europe in the 1980s, and in the latter half of that decade, soft drink consumption -- mostly in disposable containers -- jumped by 30 per cent per person. By 1988, there were more automobiles than households in Europe. 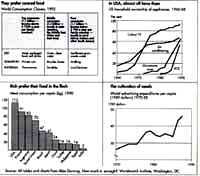 The Japanese, too, own four times as many cars per capita today as compared to 1950 and, just since 1975, eat nearly twice as much meat apiece. They are flying more as well: In 1972, 1 million Japanese travelled abroad; in 1990, the number topped 11 million. The richest 1.1 billion people on earth with an income of US $ 7,500 per family member -- Durning's global consumer class -- take home 64 per cent of the world income -- 32 times as much as the poor. The big questions are: Can the world's biosphere support 1.1 billion rich people living like American consumers? What about the rest of the people, in that case?